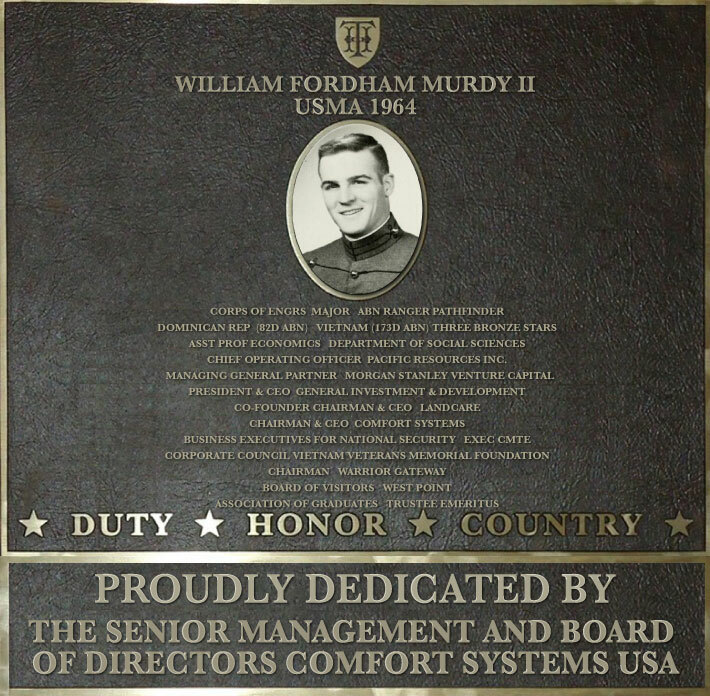 Bill Murdy was a star in his Class at West Point--earning varsity letters in 150 pound football, consistently at the top of his class academically, Editor- in-Chief of the Pointer Magazine, President of Debate Council and Forum and a recognized leader in his Class, serving as a Battalion Commander during his senior year. Bill stayed here at the Thayer Hotel the night before he signed in as a cadet in July 1960 for reception day (R-Day) and has been in love with the Thayer Hotel ever since. He graduated in 1964 and was commissioned in the Corps of Engineers. He attended Airborne, Ranger Schools and Pathfinder Schools and reported to his first assignment at Ft Bragg, North Carolina with the 82nd Airborne Division. He served three tours in combat zones. First he served in the Dominican Republic in 1964 as a platoon leader. He then deployed to Vietnam for two tours, first in 1967 and then again in 1970 as a Company Commander with the 173rd Airborne Brigade. Between his combat tours, Bill attended Harvard Business School and received his MBA in 1970 in preparation to teach at West Point. He served as an Assistant Professor of Economics in the Department of Social Sciences where he was a popular teacher among the Cadets at West Point for three years until 1974. With the end of the Vietnam War, Major Murdy resigned from the Army to pursue his civilian career to practice the economics that he was teaching- and he excelled in the civilian world. He served with a number of top companies, rising quickly through the corporate ranks into the top leadership positions of major companies. He served as Chief Operating Officer of Pacific Resources (oil and gas) until 1981. From 1981-1989 he led a financial team as Managing General Partner at Morgan Stanley Venture Capital Fund and President of its associated management company in New York City. He went on to lead General Investment and Development as the President and Chief Executive Officer for eight years in Boston. From 1997-1999 Bill cofound and led LandCare which grew to be the country’s largest commercial landscape and tree services company ($500 million revenue) until it was acquited. He became President and Chief Executive Officer of Club Quarters, a privately owned, rapidly growing chain of membership hotels catering to corporate travelers in major cities in the US and Europe. In 2000 Bill was recruited to become the Chairman and Chief Executive Officer of Comfort System USA, a $1.3 billion NYSE company providing heating, ventilation, air conditioning (HVAC) installation services in the commercial/industrial/institutional sector countrywide. Throughout his civilian career, Bill Murdy has always found time to support West Point, veterans and the nation with his time and resources. Among his many endeavors, he has been a long time member of Business Executives for National Security (BENS) and is a member of the National Board and Executive Committee. He is the Chairman of Warrior Gateway, a non-profit designed to support and integrate all the services available to veterans from both public and private organizations. He is a Co-Founder of the Thayer Leader Development Group at West Point which teaches military leadership to corporate leaders. He is a Trustee-Emeritus of West Point’s Association of Graduates and a member of the Council of Foreign Relations. He has served for several decades on the Corporate Council for the Vietnam Veterans Memorial in Washington, DC. Bill has been inducted into the "Ulysses S. Grant Society" which honors the top financial donors to the West Point Association of Graduates. He is married with two grown children and resides in New Canaan, Connecticut and Houston, Texas.